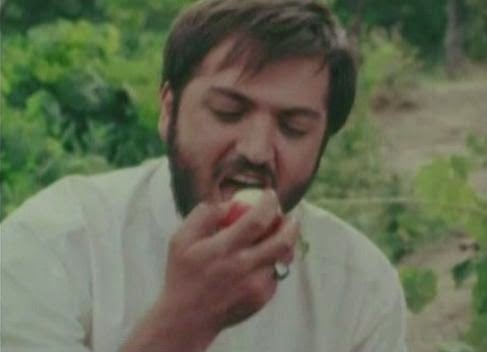 Salma and the Apple (Sib o Salma, 2011), a recent film by Iranian director Habibollah Bahmani, not only has the look and feel of a moral tale – its subject matter is self-consciously concerned with moral tales. In this respect it is like many Iranian films that are set in mundane circumstances but have a near universal scope. The story relates how the moral convictions of a young seminarian affect those he encounters on a holiday visit to his home village. Along the way, a question keeps coming to mind: what is truly important in life? 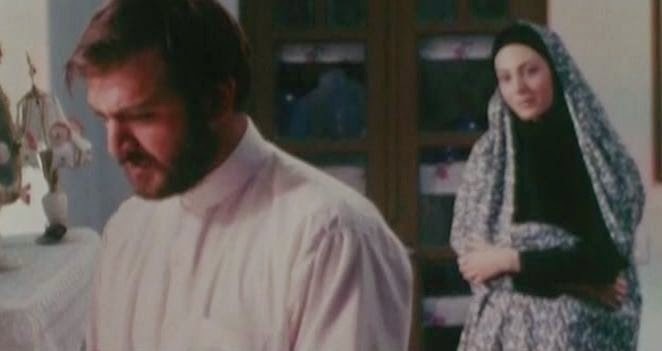 The screenplay for the film was written by Nasser Hashemzadeh, who I believe was one of the scriptwriters for Majid Majidi’s The Willow Tree (Beed-e Majnoon, 2005), and it unfolds like a series of mythic parables that are interlinked to a common theme. At the very beginning of the film, prior to the title credits, there is a hallucinatory scene of a young man meditating or praying in a pastoral setting. The camera work here, featuring multiple dissolves of shots circulating and panning around a central point, will be repeated at critical points later in the story. There is then a cut to a young woman in a parked car along a highway roadside who had apparently dozed off while driving and has just awakened from a dream. The two figures in this opening sequence will be the focus of this film, the story of which proceeds to pass through four phases or “acts”. The first act introduces Sadeq (played by Hadi Dibaji), a young man who has returned for a visit to his provincial home after having been away studying at a seminary for several years. His parents are happy to see him, and his mother urges him while he his home to use the opportunity to go visit his aunt in a nearby town and ask for the hand of her daughter, Narges, in marriage (apparently marriage to her would also come with title to a small piece of land). She supplies him with a “suitor’s bundle” – a bag of small ceremonial presents to give as part of the marriage proposal ritual. As Sadeq proceeds with this mission, we see that his humble and benign demeanor seems to have a benevolent effect on all those that he meets. When he takes an inter-city taxi trip, the driver turns out to be a former acquaintance, Hamed, who is agitated to see Sadeq with a suitor’s bundle. It turns out that Hamed had hoped to marry Narges, himself, and seeing that Sadeq is seeking the betrothal of the woman he loves, he stops his car and punches out his passenger. But Sadeq’s passive response displays boundless benevolence. At the first opportunity, he sneaks away from the taxi, leaving his suitor’s bundle and a note to Hamed telling him to offer the presents to Narges and marry her – and have the accompanying land, too. Such is Sadeq’s selfless way. Continuing on the road, Sadeq encounters a shepherd, and they exchange some cryptic pleasantries. Encounters with this same shepherd will occur at other points, and these brief scenes seem to offer symbolic shifts introducing the next act of the story. Sadeq stops by an orchard to perform his ablutions and say his prayers. When an apple drops from a nearby tree, he picks it up and takes a bite out of it. But then he feels remorse – this apple tree clearly must belong to someone, and Sadeq feels that he should have asked for permission to eat the apple. He finds a gardener nearby and asks him for retroactive permission to eat his apple. The gardener is intrigued by the young man’s moral rectitude and wants to engage him in further discussion. Soon seeing, however, that he cannot get very far with Sadeq in such a discussion, he points out that the true permission that the young man seeks must come from the landlord, Seyed Jalal, and he tells young man where to find him. When Sadeq finds Jalal, he is quickly given the permission he seems to seek, but then he is informed that Jalal is not the real landlord, either. The actual landlord had recently died, leaving his young daughter, Salma, who has recently arrived from the city to tidy up family affairs, as the true landlord. At the house Sadeq is doing his ablutions again when he sees Salma (Sogol Qalatian) from a distance, and his head begins to spin, as evoked by another encircling dissolve-laden camera shot. Later Sadeq talks to Salma, hoping that she will be the one to give him permission for having eaten the apple. Salma, though, is not so quick to grant him what he wants. She is a university graduate in philosophy and is incredulous that she has encountered such a naive young man, finally asking him, “do you live in present time?” She is impatient with such foolishness, but, like the gardener earlier, also charmed by Sadeq’s innocence. She finally tells him that she will give him the retroactive permission he seeks on the condition that he start reciting from the Quran. Immediately Sadeq goes to the garden and commences his recitations. Sadeq assumes that he will have to recite the whole Quran, so this will take awhile. He stays the night, and there are further discussions. At dinner Sadeq mentions that he had come to the area to marry his niece (not having the occasion to mention that he had abandoned that mission to Hamed). Upon hearing this, Salma petulantly leaves the dining room. The next morning, Salma criticises the Sadeq for always looking down and avoiding her gaze, and she tells him to go back to the place where he had left his “suitor’s bundle”. So Sadeq is on the road again. He runs into Hamed, who expresses guilt for having been so selfish earlier, returns Sadeq’s suitor’s bundle to him, and then urges him to go ahead and marry Narges. Once again Sadeq’s benign, passive innocence has had the effect of summoning up the virtuous instincts of those he encounters. Then Sadeq runs into Jalal, who informs him that Salma has gone looking for him and has vanished into the woods. Sadeq joins the search for her and while wandering in the fields has an incandescent, hallucinatory vision of encountering Salma by the apple tree in the orchard. In the vision they sit down facing each other, and he looks her in the eye this time. They are finally connected. But then she suddenly vanishes, and he wakes up from his dream. Sadeq goes back to the house, where he finds Salma safe and sound. She tells him that she is planning to write a book on dreams (suggesting, as foreshadowed at the start of the film, that she has dreamed of him, too). Then she asks him, “what was the verse you were repeating from the Quran last night?” His rueful answer is simply, “is God not enough for His servant?” Then he departs for good. So the brief encounter between Salma and Sadeq ends without them really determining what is the essence of haram and halal. Perhaps they are only left with vague feelings of unspecified guilt. Certainly we, ourselves, may be left with questions concerning what it all means. The story of Adam and Eve is told in both Christian and Islamic versions, but there are some differences. In the Christian story, Adam and Eve are told by God not to eat the forbidden fruit from the tree of knowledge of good and evil. Tempted by a serpent (thought to be Satan), though, Eve does eat the fruit and offers it to Adam. In the Quranic version of the story, Hawwā’ (Eve) does not tempt Adam to eat the fruit – they both simply shared the fruit together. Also neither the Bible nor the Quran explicitly mentions that the forbidden fruit was an apple. The idea of it being an apple is a Western tradition that may have been associated with translations of the Bible into Latin and confusions over the similarity of the Latin words for ‘apple’ (mālum) and ‘evil’ (mălum). Nevertheless, perhaps due to various cultural interminglings over time, it is my understanding that past Persian poets have explicitly referred to the forbidden fruit of this story as an apple, and so the idea of the “forbidden fruit” being an apple is familiar to many Iranians. Perhaps, then, the idea of the apple symbolically representing worldly temptation is an underlying motif in Salma and the Apple. The story of Yusuf and Zulaikha, meanwhile, may be more directly relevant to the Salma and the Apple narrative, and indeed Salma makes an explicit reference to the story during a conversation with Sadeq. In that ancient story Joseph, son of Jacob, is dropped by his jealous brothers into a deep pit in the desert. Passing traders find the boy and sell him to the Egyptian nobleman, Potiphar. Potiphar’s wife, Zuleika, is soon overcome with lustful passion for the handsome Joseph, and she attempts to seduce him by various means. But Joseph, mindful of not committing the sin of adultery, resists her efforts. In the ancient Jewish version of the story, Zuleika is depicted at length as a relentless sexual predator, while the Quranic version offers only a relatively terse description of their interaction. Nevertheless, in all three Jewish, Christian, and Islamic holy texts, Zuleika is cast as an evil seductress bent on corrupting the handsome young man. However, later Persian Sufi poets Hafez, Rumi, and Jami cast her in an entirely different light, focussing on her self-effacing surrender to eternal love. From this latter perspective, Zuleika’s commitment to completely selfless love is akin to divine union with the mysterious Almighty. So is Salma comparable to Zuleika in the ancient tale? Certainly she has the lordly role here of the overseeing mistress (of the farm), and she may be also somewhat captivated by the innocent charm of Sadeq. But she never expresses any lustful desires for the young man, just a fascination . All we are left with is vague inquisitiveness. And indeed that is the character of the entire film. We have an extended mood piece before us that has been enhanced by fine acting performances, evocative music (by Sattar Orkay), and occasionally dreamlike camera work. But at the end a satisfying closure is not reached. In the end Sadeq’s response to his own question, “Is God not enough for His servant?”, is to withdraw from life and return to the seminary. By doing this he avoids corrupting himself, but he also misses an opportunity to find sublime enlightenment. The Persian Sufi poets had it right – the way to spiritual fulfilment is through loving engagement with another soulmate. The potential infinite rewards for taking this path outweigh the risks. In fact even the brief encounter between Salma and Sadeq – that momentary engagement – accomplished something important and of permanence. For she was changed by him, and he was changed by her. The film presentation steers clear of any sensuous suggestiveness, and, for example, none of the nine or so women shown in the film show even a single strand of head hair.